Pass the Salt… was created through a series of mini collaborations between Lucy and fellow dance artist Tara Baker, together Shortcut Dance. Both based in Sheffield, this movement based collaboration emerged when the pair began to create together in 2013. 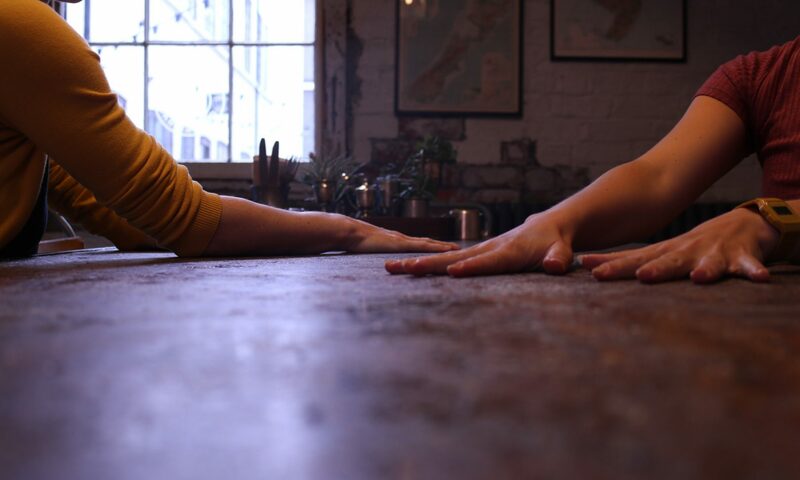 Pass the Salt… was originally created as a short playful dance duet which took place on two chairs whilst performing a series of gestural movement patterns set to the hypnotic music track Won’t Wash by pop Artist Hot Chip. With every performance the work was purposely adapted to reflect or fit the environment/theme of the event or platform. The piece has been performed at a number of local and regional arts events and scratch platforms including, Tramlines Elevator Fringe Festival, (Sheffield 2013), Word Smack Cabaret, (Rotherham 2013), Nexus Art Festival, (Leeds 2014), and Allotment Soup, (Sheffield 2014). Shortcut Dance enjoy exploring the limitless possibilities in a limited space. This idea of creating big dance for small spaces led them to develop Pass the Salt… during 2015/16. Through a residency at Yorkshire dance in Leeds and a residency space and support from Access Space in Sheffield, the pair have collaborated with visual artist Lili Robbins to create a film. The film encompasses movement from the original choreography and ideas explored through the research and was premiered at Access Space in 2017.